Jobs' claim that you can supplant Flash with the App Store and the Web omits a critical point: Even if you could get the same experience with those means, it wouldn't be free. Case in point is Canabalt, a fun little time waster that's free on the Web but $3 on the iPhone. Gaming isn't the only example, as the MLB At Bat app costs $15 but there's no way for MLB.tv subscribers to watch games for free in the iPhone Web browser. Yes, allowing Flash on the iPhone would taint the experience of that particular device, but it would also represent a way out of Apple's ecosystem. Like any Web app, Flash games or other applications can store your data in the cloud, letting you pick up from where you left off on another machine. You can't say that about the App Store unless all your devices run the iPhone OS. Apple may have the world's largest gaming platform on volume alone, but it doesn't have a community built around it. iPhone gamers can't play on Flash game sites like Kongregate, which gives players achievements, challenges, contests and chat rooms. Nor can they enjoy the gamut of Facebook games that are fused with their existing social networks. Even if a high-profile game like Farmville came to the iPhone, it wouldn't replace the entirety of those community features. In writing, the term "weasel words" means avoiding specifics in order to twist the truth or cover for a lack of research. 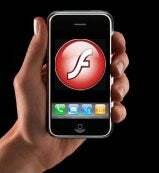 Adobe says Flash allows for the full Web, and Jobs' counter-argument has a couple of these weasel words. He says "almost all" Flash video is available in more modern, iPhone-supported formats, and says iPhone users "aren't missing much" video. What does that mean, exactly? That they're still missing -- and here's a weasel word of my own -- a decent amount. Ultimately, the Flash debate comes down to principle. Apple wants to control the experience people have on iPhone OS devices, ostensibly for the benefit of consumers but partly for the company's own good. But the great thing about Flash on PCs is that you can avoid it. You can choose not to install Flash in your Web browser, or use an extension like ClickToFlash, which hides all Flash operations except for ones you specifically allow. Having the choice to do so is a wonderful thing.